The Essential Medical Demi Feather light Walker is the flagship for quality, comfort and stability! This walker has an extra feature of a lower seat height making it perfect for users from 4' 8" to 5'4". 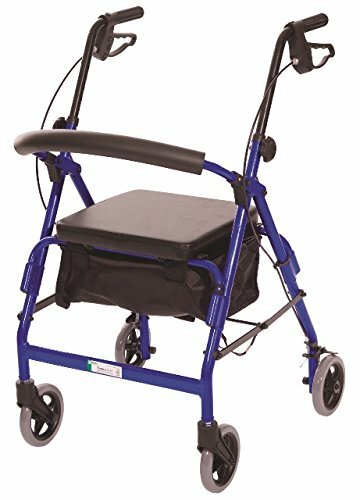 This walker will take you almost anywhere on 6" mag wheels secured with loop lock brakes. When you get tired, just sit down and rest on the soft comfortable 182 sq. in. seat. But please don't forget to lean back on a rounded back bar that is padded for your comfort...and flips up when loaded into the car or when you are near a counter! Need to take anything with you or shop while you are out? Put it in the large vinyl pouch that it securely placed under the seat or basket since it comes with both. Use the basket to carry items and the pouch to secure your valuables. Concerned with putting it in the car or transport? Don't worry since it will fold compactly with it's included folding strap and locking strap. Don't worry it won't open up like other walkers. It's also made of lightweight, reinforced aluminum so don't worry about you, your caregiver, or loved one picking it up. The best thing too is you don't have to worry about sacrificing your personal style since there are three great color options to choose from: Blue, Green, Red, Silver and Teal!!! There is nothing you can't do on a Feather light Walker except not enjoy it! Weight Capacity: 250lbs. Height Adjustable: 30" - 35 1/2" Seat Height: 18" Width Between Handles: 17 1/2" Overall Width: 23 1/2" Seat Size: 14" x 13" Weight: 14lbs. View More In Walkers, Rollators & Accessories. If you have any questions about this product by Essential Medical Supply, contact us by completing and submitting the form below. If you are looking for a specif part number, please include it with your message.